Yogi Berra may have counseled “when you get to a fork in the road, take it,” but photographer John Nichols is apt to not only take the fork, but will probably examine it, learn from it, and happily follow wherever the path will take him. Or, perhaps more accurately, wherever many paths might take him. “Photographer” is too narrow a description. 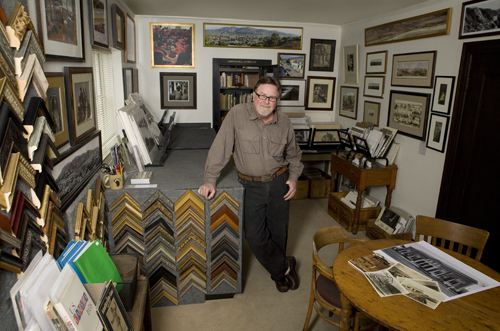 He has been a teacher, museum curator, small business owner. He is a gifted essayist. He has served as stage manager at the Monterey Jazz Festival. His passion for history and photography culminated in a superb collection of materials about the St. Francis Dam disaster that was purchased by the Museum of Ventura County. John Nichols’ documentation took place in 2010 and was sponsored by John and Cherie Brant and Sandra and Jordon Laby. The FOTM Archive contains extensive information about this artist.